On a recent summer day in Nashville, Kara Teising opened her Facebook page for a lunchtime scroll through her timeline when she discovered a photo posted by her son’s daycare: an image of her 18-month-old son surrounded by other toddlers, their chubby faces glued to a brightly colored, animated screen of an iPad. The accompanying post read, “We are taking a BYTE out of our new Apple iPads! We are hungry for learning!” Teising was shocked, unaware that the school, which serves children from six weeks old to pre-K, even had iPads. Teising was promised that her son could be separated from the group while the others worked on apps. She was given the example that if the other toddlers were working on an app comparing the size of circles, her son could do the same thing, only with “real circles.” Teising couldn’t see what made the digital circles any better than the real ones in the first place. After several discussions with the school’s leadership, Teising and her husband decided to pull their son out. Teising isn’t the only parent asking questions about their young children and iPad use--there's a robust conversation going on now about apps for babies. Screen Time author Lisa Guernsey recently wrote a Slate piece emphasizing an app’s context--namely, parent interaction--over content when it came to iPad learning for the smallest children. While the American Academy of Pediatrics (AAP) recommends no screens before the age of two, research is murky on whether screen time--especially “interactive screen time” in which the screen responds to the child’s activity, through touch, voice or click--is good or bad for the youngest children. This is a topic Hanna Rosin covered here at The Atlantic a few months ago in “The Touch-Screen Generation.” Rosin interviewed many experts and appeared to conclude that, much like television, even if screen time was not specifically educational, parents who rationed iPad time for their little ones were probably not doing any significant harm. How are parents to know when it’s developmentally appropriate to introduce screen time into daycare/preschool settings, and how much time their toddlers are parked in front of a “learning” screen? Heather Kirkorian, an Assistant Professor of Developmental Psychology at the University of Wisconsin, researches toddlers’ ability to learn from video and other screen media. She told me that the National Association for the Education of Young Children already issued a recommendation to bring interactive screens into early-childhood classrooms back in 2011 (in direct opposition, it seems, to the AAP’s recommendation). 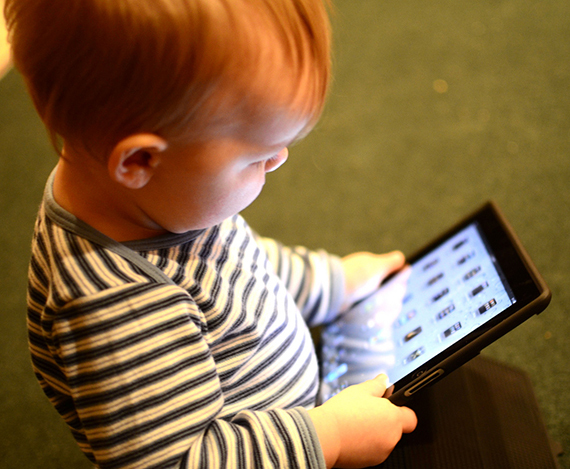 The report endorses touch-screen media by saying, “When used intentionally and appropriately, technology and interactive media are effective tools to support learning and development.” For babies and toddlers, the report recommends that screen time not be passive (like watching a video) and always accompanied by human interaction. But Kirkorian believes this recommendation may have been premature, because research on the effects of iPads on toddler brains is still preliminary. The data her team has collected so far suggests that interactive devices might hold some promise for educational value at young ages, but it’s too soon to be completely certain. To find out whether young toddlers, between 24 and 30 months, could learn better from an interactive touch screen than just plain video, Kirkorian had kids learn a new object, called a “toma,” on three different kind of screens: non-interactive, general interactive, and specific interactive. In the non-interactive video, children were instructed to watch the screen to find the toma, with no pause in the video; the general interactive video asked children to touch the screen anywhere to find the toma, followed by a pause. But in the specific interactive video, kids were instructed to touch a box in order to see the toma, and the video wouldn’t continue until they touched the box. Afterward, children were asked to find the toma among four real objects presented to them. Older toddlers learned equally well from each of these conditions. However, younger children (e.g., 24-30 months in the word-learning study) only showed reliable learning in the third condition. As in many other studies, these younger toddlers did not learn from traditional, non-interactive video,” Kirkorian wrote in an email. “Moreover, general interactivity did not seem to help them learn. Rather, they only demonstrated learning when they interacted with the video in a specific way that required them to focus on critical information (e.g., the object that the model was about to demonstrate). When I took a casual straw poll via social media, nearly all the parents who responded strongly agreed with Teising--they want their little ones to have nothing to do with digital media during the school day. Most said they’d prefer their toddlers focused on play with sensory objects and social interactions. Many were concerned that lots of screen time at very early ages could cause emotional and developmental problems later on, which is supported somewhat by more murky research suggesting that kids who get lots of screen time can have more anxiety and depression. But even that has a lot of ‘big ifs’ attached. My theory is that parents’ apparent strong feelings that toddlers should be spending more time splashing in puddles, sniffing roses, and eating Play-Doh, and less time staring zombie-like at a screen are really misplaced for our own ambivalence toward our technology-addled (or addicted) lives. When thinking of our children lined up at rows of laptops, tapping away at keyboards for the rest of their school careers, parents may have the urge to reach out and say - no, not yet. Plenty of time for computing later. Teising is happy that her son is now at home, tech-free, with a nanny and a little bit of Sesame Street. She is surprised that no other parents at the school have expressed concern for the iPad usage, but she still feels she made the right decision. “I mean, they’re babies,” she said. Holly Korbey writes about parenting, education, and media for The New York Times, Brain, Child magazine, and MindShift.